You probably couldn’t walk a mile without coming across someone who wants to shed a few pounds. Being obese or overweight is common specially as many people have turned towards a sedentary lifestyle coupled with a less than desirable diet composed of food laden with ingredients you can barely spell let alone pronounce right. The U.S. considers obesity as an epidemic and rightfully so. They’re among the top countries that have a rising obese population with more than a third being affected. And while we like to say theirs is an isolated case, the obesity problem has also risen all over the world. The World Health Organization (WHO) said worldwide obesity has more than doubled in the last thirty years and is currently at a high of 2 billion adults over 18 years of age. Among them, 39% are considered overweight and 13%, or roughly 260 million people, are obese. This means at least 3 of 10 people are overweight and 1 of those 3 is obese and this is an alarming trend we won’t see going away any time soon. With all the data presented, we can’t just say people who are overweight want or choose to be that way. We can say that among the 2 billion people who are overweight, a good chunk of them must want to lose the weight but struggle at it. And when people struggle, that’s when they turn to weight loss supplements like Phen375, a product that claims to make users lose weight by suppressing their hunger and increasing their body’s ability to burn fat. In their website, Phen375 claims to be a dietary supplement designed for weight loss and hunger suppression. 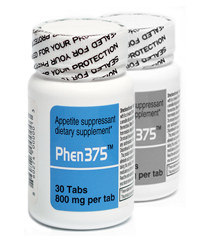 Based on the name, Phen375 also seems to be designed to mimic a drug called Phentermine. Phentermine is a stimulant similar to an amphetamine. It acts as an appetite suppressant by affecting the central nervous system. Directions for use: Take one pill a day and it’s recommended that you take it for three months to see the full benefits. Phen375 made use of a proprietary blend which means we have to guess our way into analyzing the formula. Luckily for you, we actually know how to read labels and make use of the information the website tells us to form an accurate assessment of just how much of one ingredient did they include per serving. Chromium – It seems to help balance blood sugar and regulate insulin resistance, which may support fat loss by keeping appetite stable and fat storage minimal. A 2008 study states “The exogenous administration of chromium picolinate suppresses food intake, particularly when administered in large doses.” This ingredient works amazingly in small doses so the amount we get here should be more than enough. L-Carnitine – This is known to funnel fatty acids into cells’ mitochondria which helps optimize thermogenesis and give the user more energy. Thermogenesis is when your body carves the fat from your fat stores and incinerates them to give you energy and the resulting warmth you feel is from the heat it releases. Phen375 says the formula consists of 68% L-Carnitine and that’s roughly 350 mg which means the last five ingredients will fight over 166 mg of space. Caffeine – Caffeine is the world’s most popular psychoactive drug but on top of being a good buzz-booster, caffeine helps stimulate fat burning by boosting cAMP and norepinephrine, two compounds that signal your body to start shredding fat for energy. Coleus forskohli – It’s standardized to 10% forskolin, the active compound in the ingredient. This compound increases cAMP for fat burning and also promotes what we call Long-Term Potentiation, a brain activity that helps the user have better memory recall and overall mental performance. Dendrobium – This herb is known for its anti-inflammatory properties and not really a weight loss ingredient. Many also claim it to be a stimulant but the only study about that is when it was used as part of a preworkout. One of its active compounds, dendrobine, was suggested to be a convulsant which could promote seizures. Cayenne – You know how cayenne makes your mouth feel hot and make you sweat all over? That’s your body trying to cool you off and the only way to trigger your sweat glands is if your body starts burning fat for heat (aka thermogenesis) and this makes cayenne a natural choice in many weight loss supplements. Citrus aurantium – Contains 10% synephrine, a compound that works by increasing the thermic effect of food which makes you expend more calories to digest what you eat. It also activates Beta 2 and Beta 3 receptors which trigger the breakdown of triglycerides and Brown Adipose Tissue (BAT) and gets your metabolism on overdrive. The main theme of Phen375 is simple: Promote thermogenesis and suppress appetite. It’s one of the basic approaches to weight loss and Phen375 has the right kind of ingredients to pull this off. The only problem we see here is dosing. One serving is just a few milligrams over 500 with the bulk of it going to L-Carnitine which makes sense since L-Carnitine requires a lot of weight if you want it to work well. The rest are left with 166 mg to work with. Phen375 could still pull it off with the possible dosage for Caffeine and Coleus but it will struggle trying to make Cayenne and Citrus aurantium work specially since both require 40-50 mg to get the minimum effect. As for Dendrobium, we really see no point in adding an anti-inflammatory ingredient in the mix since Phen375 doesn’t seem to market itself as a preworkout specially since the claims all point to reducing the amount of food you eat. Perhaps in the future Phen375 can remove Dendrobium and share the load a bit better for the rest of the ingredients in its formula. Until then, we really can’t see anything special about this product aside from it being a basic weight loss supplement that works but not as much as it should. We also would like to criticize the amount of other ingredients Phen375 has. Those ingredients act as fillers or straight up added for aesthetic value, two things we don’t need in a weight loss supplement. The fluff literally outnumbers the actual ingredients in the formula and would make any sane customer wonder about what they’re really paying for. All in all, Phen375 is not a special weight loss supplement. It wants to act like a professional weight loss pill but really, the mismatched dosing is what killed it. It still works and could potentially help you lose weight by way of appetite control but don’t expect it to cut your waistline by 4 inches in one month without you lifting a finger. On top of being a decent appetite suppressant, Phen375 could also make you feel more energized throughout the day not just because of caffeine but also due to how it can tweak your hormones to burn more fat for energy. It’s also great at producing heat which should help you keep warm without the need of putting an extra layer of clothing. What kind of experiences do users have with Phen375? We scoured the internet for user feedback and found that it does work as advertised particularly on how it can reduce cravings and increase daily energy levels naturally. Of course, this is provided that you also do your part in maintaining a healthy diet and getting some good old fashioned exercise. Phen375 is by no means a miracle weight loss pill. There’s no such thing as a magic pill for weight loss and while we did find poor reviews on it, those users may or may not have done their share of the work. We would never know but what we do know is by the end of the day, each person responds differently to supplements. The most common side effects associated with the ingredients in Phen375 are nausea, elevated heart rate and blood pressure, the jitters, and even insomnia. These side effects are mostly due to the stimulants found in the supplement but we wouldn’t be worried too much about it since the dosages seem to be leaning towards the minimum. Phen375 is a straight up basic weight loss supplement. It doesn’t have any fancy blends and lacks the presence of premium ingredients such as Capsimax for cayenne. Advantra-Z for synephrine, or any highly standardized herbals (e.g. Green Tea extract std. to 45% EGCG, Green Coffee Bean extract std. to 50% CGA, Garcinia Cambogia std. to 60% HCA, etc.). It might help you reduce appetite and boost energy but nothing too extreme. It has potential once it tries to adjust the dosing but until then, the only reason to buy this is if you’re okay with the price which is a bit high for what it gives you, relative to other more potent fat burners such as the highly acclaimed supplements Instant Knockout, EVL LeanMode, and LEGION Phoenix.